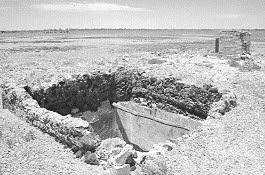 During the construction of the Overland Telegraph Line a waterhole was located in 1871 by two surveyors McMinn and Knuckey . A repeater station was established in 1872 along with a post office, general store and residence. The Charlotte Waters Overland Telegraph Station was nicknamed Bleak House by the telegraphists as the area was a desolate gibber plain with no plants or trees. As technology improved some telegraph stations including Charlotte Waters were by-passed. The building was then used as police stations, but certain vital equipment and postal services were left, which the policeman and his wife maintained. An old man had been living in the abandoned police station during 1939. Fred Sharpe (Assistant to Old Andado owners McDill) in the same year discovered the man dead body. Sharpe and a policeman buried the old man near the ruins just days before CT Madigan started his expedition. Now for the heart breaking saga, which critically affected an outback policeman, his family neighbours and friends, occurred in Central Australia in 1936. Police Constable Jack Kennett, his wife Isabel and their five children lived at the lonely Charlotte Waters Police Station. One of the Kennett family's neighbours, the McDill family from Old Andado Station (Formerly known as Andado) went south for Christmas 1935. On their return early in February 1936 Jack Kennett met them at Abminga Railway Siding and took them back to Charlotte Waters where they had left their vehicle. Mrs Eleanor Lucy McDill was unwell and wanted to return to Adelaide. Mr Robert McDill had to return to the station and so their young daughter Lois stayed with the Kennett family. Unbeknown to them all, while in Adelaide the family had been in contact with people suffering from diphtheria and were carriers. The Kennetts had five children: young Jack aged 12 years, Jim 10 years, Joyce eight, Joe six, and baby Rosslyn aged 18 months. A few days after the McDills' visit, Joyce injured herself playing in the yard and needed medical attention. The track from Charlotte Waters to Alice Springs was treacherous and the journey took from one to five days. There were many sandy bends in the dry Finke River to cross and about 30 kms of high Depot Sand Hills, north of Horseshoe Bend. The train from Adelaide was due that day at the Abminga Siding, so Jack and his Aboriginal tracker, Tracker Bob, travelled by rail with Joyce to Alice Springs. Joyce received treatment at the Australian Inland Mission Hospital, later known as Adelaide House. The travellers stayed with Mr and Mrs Jim Orr in their railway cottage. The population in Alice Springs then was about 600 people. Isabel Kennett remained at Charlotte Waters to look after the other children and attend to the Post Office duties. A day or two later baby Rosslyn became very sick. Isabel telephoned her husband to ask him to get a lift back to Charlotte Waters and drive her and the baby up to Alice to see Doctor Paddy Reilly, the Government Residential Medical Officer. However Dr Reilly had left Alice that morning to go to Horseshoe Bend with Claude Golder to attend a man who was very sick with suspected arsenic poisoning. Jack asked Fr Percy McDonald Smith to drive him to Charlotte Waters. Fr Percy was involved in levelling the ground in Bath Street to start building the original Church of the Ascension. 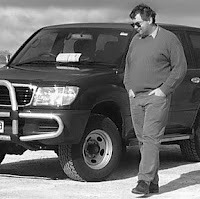 He agreed to go but first had to mend a spring in his Ford V8 utility. The party Fr Percy, his little dog Ditto, Jack, Vic Pearce and Tracker Bob set off on the afternoon of February 13th 1936. A nightmare period followed of 11 days in the February heat and harsh conditions for the Kennett family, friends and neighbours, yet worse was to come. Fr Percy and his companions drove from Alice down the track which led through Maryvale Station. When they reached the Depot Sand Hills they found Claude Golder and Dr Reilly bogged in one of the worst dunes. Jack eventually was able to drive the doctor's car out of the sand bog and they all proceeded to Horseshoe Bend. The doctor attended to the sick patient, while Jack investigated the possible suspicious circumstances of the poisoning. Isabel telephoned to say baby Rosslyn was worse. The doctor spoke to her on the phone and diagnosed diphtheria. He was anxious to see the baby so both cars set off for Charlotte Waters where they arrived about midnight. Dr Reilly gave the baby serum and at about 3.30am both vehicles left for Alice Springs. Jack drove Isabel, Baby Rosslyn and Tracker Bob. Fr Percy took Dr Reilly in his utility, while Vic Pearce stayed at Charlotte Waters to look after the three Kennett boys and Lois McDill, as well as to attend to the Post Office duties. Knowing that Fr Percy was an inexperienced bush driver and that it was dark and tracks difficult to see, Jack tried to keep Fr Percy's headlights in sight in his rear view mirror. After a while he realised the utility was not following him. Jack waited, fearing Fr Percy must have taken a wrong turning, but after half an hour, with the baby very ill, Jack continued on to Horseshoe Bend. There Mrs Ruby Elliott, a trained nurse, seeing the baby's condition, suggested she travel with them. Just after they had passed Maryvale Station little baby Rosslyn died in her heart broken mother's arms. Mrs Elliott then nursed the little form and the sad travellers continued to Alice Springs. Isabel was put in quarantine and had to stay in Mrs Orr's cottage. The Methodist Minister, the Rev Harry Griffiths, officiated at baby Rosslyn's funeral as Fr Percy had not arrived in Alice. Poor Jack had to carry the little coffin and place it in the grave himself, while grieving friends had to stay 20 metres away because of the quarantine regulations. Sister Jones, wife of Jack Jones, the Welfare Officer at The Bungalow, (previously the Alice Springs Telegraph Station) helped Mrs Orr look after her charges. Although the Kennett family were in quarantine, the town women cooked meals and passed them through the hedge to help Mrs Orr. Meanwhile, Fr Percy and Dr Reilly had driven through the night on bush tracks but realized when the sun rose they had missed the turn off in the darkness and had driven about 70 km west instead of north. They turned around but later the car became bogged in the sand. They tried to dig the vehicle out all day in the hot February sun. By late afternoon they decided to walk to Horseshoe Bend about 60 km away. Tormented by flies and the heat they had to rest often. At midnight Dr Reilly decided to walk ahead as Fr Percy was small and frail. The doctor was anxious to get to Alice as he was worried about the two little Kennett girls. He took a long drink from the water bag, which he left with Fr Percy, and set off. Fr Percy continued to walk as far as he could, then decided to rest and used the water bag for a pillow. When he awoke, he found the weight of his head on the bag had pushed the cork out and all the water had seeped into the sand, so he and his little dog had to continue on with no water. When Dr Reilly arrived at Horseshoe Bend, Gus Elliott immediately drove him to Rumbalara Siding to catch the train to Alice. Fr Smith and the bogged utility were retrieved and taken to Horseshoe Bend. Later in the day, Vic Pearce telephoned Jack in Alice Springs to say Young Jack and Jim had both developed sore throats. A passing traveller kindly agreed to drive the three Kennett boys and Louis McDill to Horseshoe Bend to meet Fr Percy. Jack was worried that Fr Percy would have trouble in the Depot Sand Hills so he set off with two friends and Tracker Bob to meet him. However, Jack's vehicle broke down south of Maryvale Station at Alice Well. The next morning Fr Percy arrived at Alice Well. Jack and his offsiders piled into the utility, making five adults, four children and two of them sick with diphtheria and the dog. They eventually arrived in Alice Springs. Meanwhile, little Joyce Kennett had succumbed to diphtheria. Jack had saved enough money from his constable's wage to send his eldest son to boarding school in the February. There was no Flying Doctor Service in Alice Springs then and so Jack used the school fees money to charter a plane from Adelaide to take Joyce to the Infectious Disease Hospital in the city. However, the pilot was delayed with dust storms and also had to stop at Farina to pick up anti-diphtheria serum. When the plane arrived in Alice it was late at night and it needed servicing. In any case, in the morning Dr Reilly woke Jack to tell him that Joyce's heart was failing and she was too ill to travel on the plane. Fr Percy went to her bedside and started to say The Lord's Prayer. The little girl rallied and joined in saying the prayer to the end, then died. Poor Jack had to open the grave and carry his daughter to bury her with her little sister. Fr Percy officiated at the service at which everyone wept. Isabel and the two older boys also succumbed to diphtheria and were in quarantine for a month. Dr Reilly asked the police authorities to transfer Constable Kennett to a different place, where he and his family would not have such sad memories. However, it was nearly a year before Jack was moved to Alice Springs. Jack went home to Charlotte Waters first and packed up the little girls' toys and clothes to save his wife the anguish. The townspeople all grieved for the Kennett family and wanted to raise money to help pay for the charter plane, but Jack declined their kind offer. The townspeople then contacted the Flying Doctor Service which had begun operations in Cloncurry, Queensland, and asked for the service to be extended to Alice Springs and it was. Mrs and Mrs Ted Colson lived south-west of Charlotte Waters on Bloods Creek Station. Ted had always wanted to cross the Simpson Desert with camels, from his home to Birdsville. 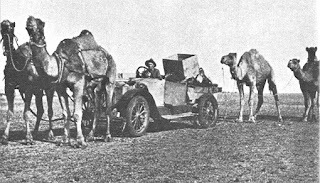 Rains fell in March 1936 and Ted thought it safe to travel as there would be herbage for his camels. In appreciation of Fr Percy's help and ministry, Jack and Isabel Kennett donated the marble font to the Church of the Ascension. It is inscribed with the little girls' names, Joyce and Rosslyn, and the text, "Suffer the Little Children". The names of Constable Jack Kennett, his wife Isabel and children have been perpetuated in Alice Springs in the street named Kennett Court.